A Brief History of the Future by Charles Joynton suggests that the first mission to Mars was sent in 2071. One of the biggest challenges in trying to establish a colony there is the extreme weather conditions. 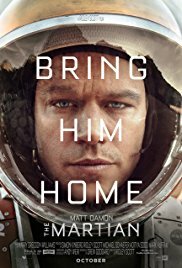 The film The Martian starring Matt Damon illustrated well the extremes of temperature and the dust storms. 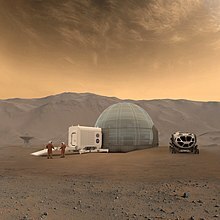 The Wikipedia article about the colonisation of Mars has an illustration of a habitation module made out of ice, and the Mars One project actually has an animated mockup of their proposed solution. All the science fiction I've seen portrays various types of habitation modules, but Charles Joynton has a novel approach. The shuttles of the Mars mission land in a sand-filled crater and fire their thrusters downwards to sink the shuttles into the sand. 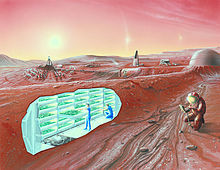 A tube is attached to an airlock in the shuttles' roof to give access to the surface, extending as the shuttles sink to the bedrock. 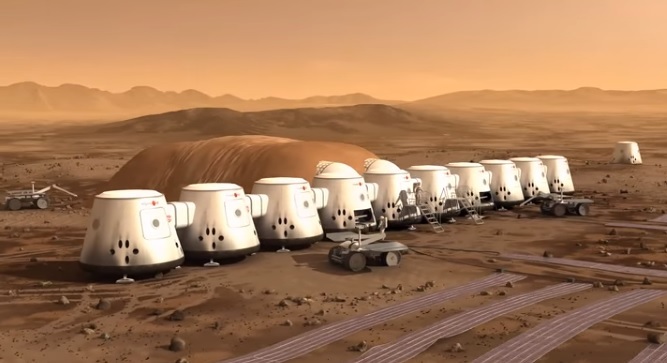 Once the three shuttles are stable they build tunnels connecting the rear airlocks, which are double and can be moved along the tunnel to test that the tunnel is airtight. In this way they overcome all the problems with the weather - by building underground!